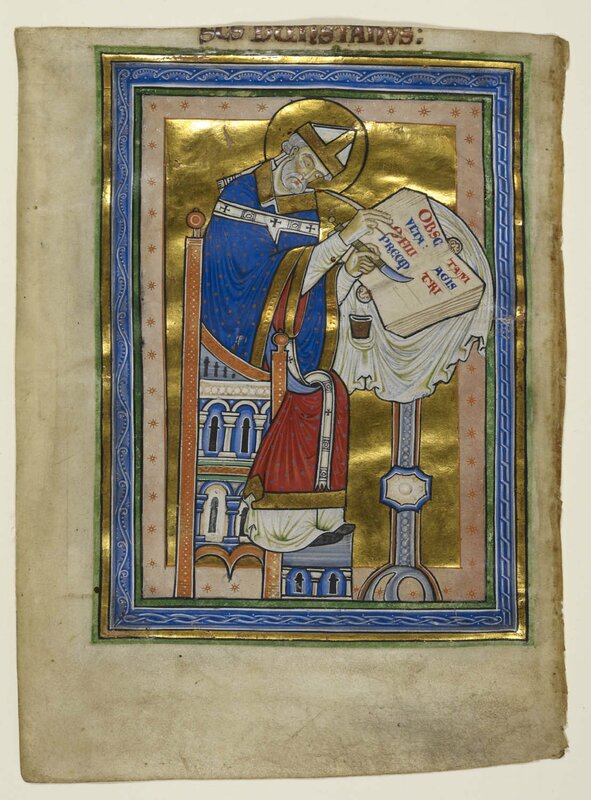 © The British Library Board, Royal MS 10 A.XII, folio 2v: Saint Dunstan as Scribe. Reproduced by permission. 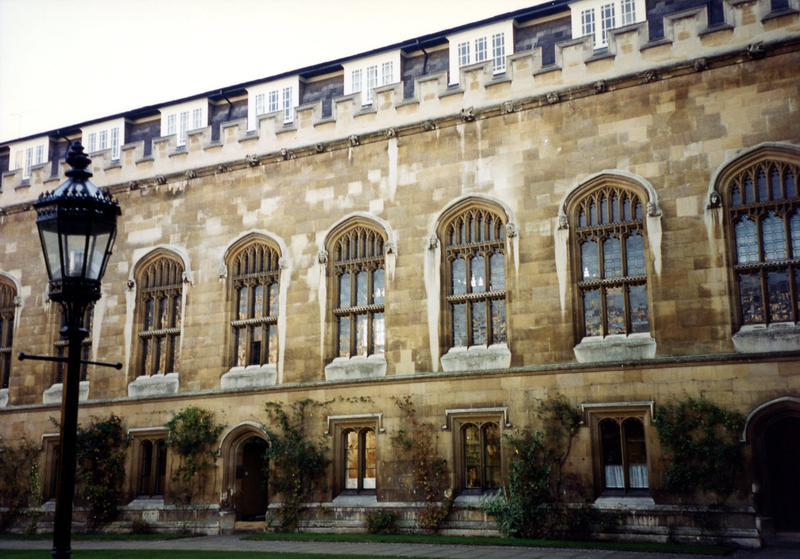 One more Seminar in the same Series took place at The Parker Library in June 1995 (see below), after the Research Group had completed its major long-term research project there, had moved its principal base to the United States, and had begun its next series of scholarly events devoted to specific subjects of research on manuscripts and other written materials. 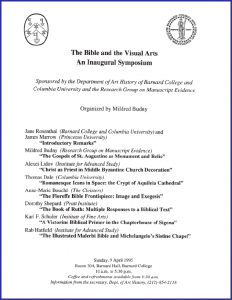 Those series took the forms, in turn, of the Annual Symposia on “The Transmission of the Bible” (1995–2000) and then the “The New Series” (2001–) of Symposia, Colloquia, Workshops & Seminars. 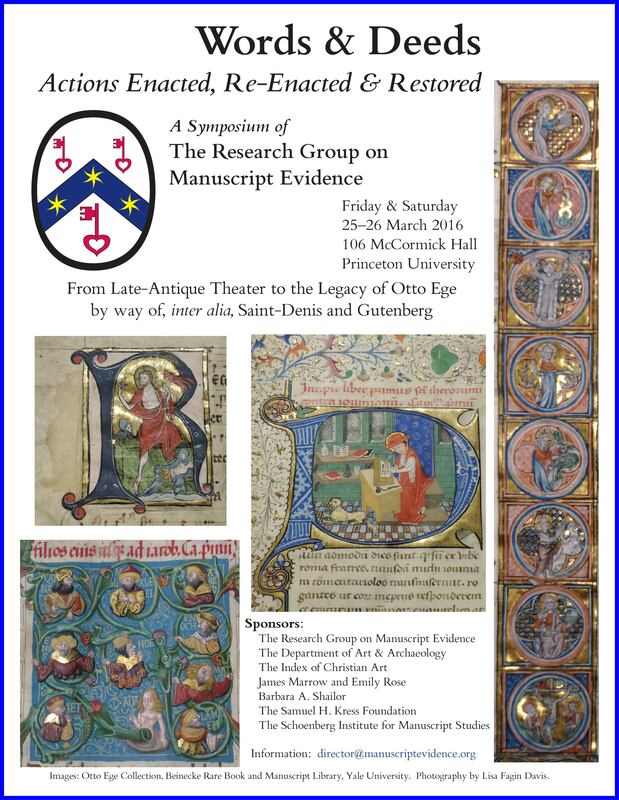 We plan to hold a Research Group seminar on Monday, 19 September, devoted to manuscripts from Canterbury. 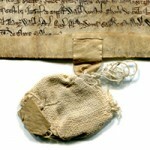 It will consider the subject of surviving manuscripts and fragments made at Canterbury and/or owned there in the medieval period. 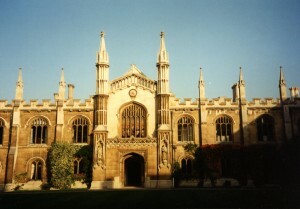 Many of them are preserved at the Parker Library, from both Christ Church Cathedral Priory and St Augustine’s Abbey; they were acquired by Matthew Parker, archbishop of Canterbury, in the sixteenth century. 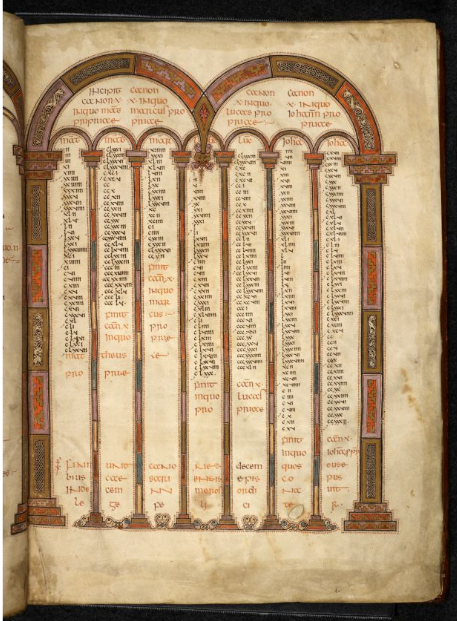 As these institutions were among the largest ecclesiastical owners and longest-standing producers of manuscripts in medieval England, the survivors from Canterbury libraries and workshops exhibit a very wide range of types of books, texts, scripts, decoration and patterns of usage, both formal and informal. 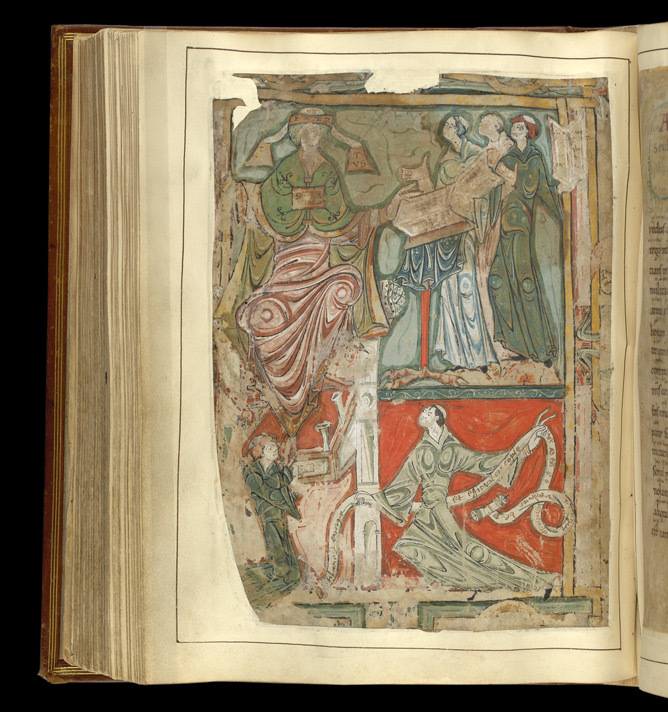 Their study reveals much about the history of book-production, patronage, ownership and use in England from the medieval period to the present. As usual, the seminar was designed informally, “as a round table”, to “give plenty of opportunity to respond to the speakers and ask questions”. From the location in Cambridge, we surveyed, at a distance of both time and place, some highlights of the surviving legacy of book-production at Canterbury in the early Middle Ages. 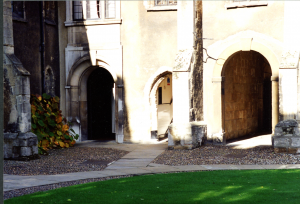 From the surviving (mostly late-medieval) catalogues of the libraries of both Christ Church Priory and Saint Augustine’s Abbey, viewed against the surviving identified or identifiable books, or parts thereof, it is painfully clear that the ruins of the libraries’ former glories, fragmented and dispersed, all-too-closely resemble the mangled and poorly, destructively, excavated ruins of Saint Augustine’s Abbey itself. 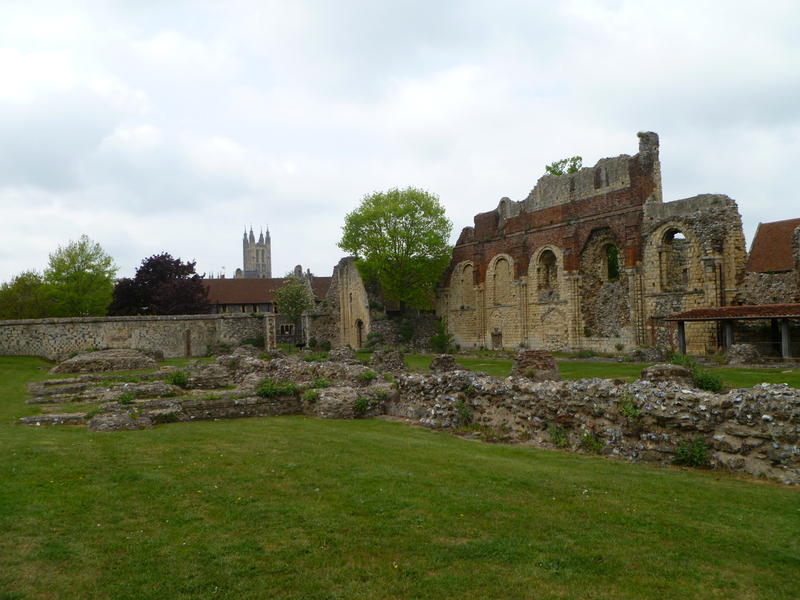 Ruins of Saint Augustine’s Abbey. Photograph by Casey and Sonja, via Wikipedia Commons. The Invitation Letter described the plan, naming speakers and subjects, without formal titles as such. Even the order of presentations might, as not infrequently in the Series, vary somewhat from the order described, while others among the participants contribute to the proceedings as well. 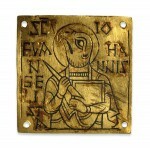 Whetting the appetite, the Letter named names and cited some Corpus manuscripts. 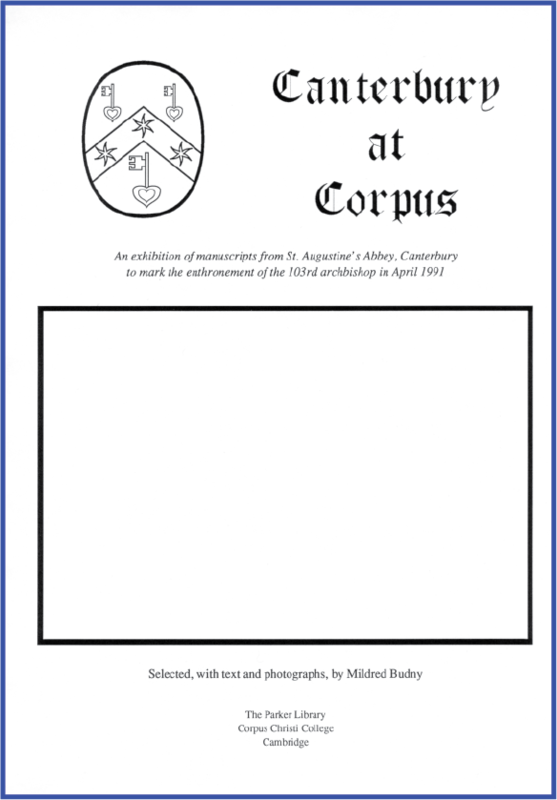 Cover / Poster (minus the pasted-in-photograph from Corpus Christi College MS 286) for the exhibition of ‘Canterbury at Corpus’ held at the Parker Library in 1991. 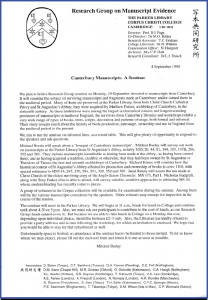 Mildred Budny will survey our work on manuscripts at the Parker Library from St Augustine’s Abbey, notably MSS 20, 44, 81, 144, 189, 197B, 286, 352 and 389. 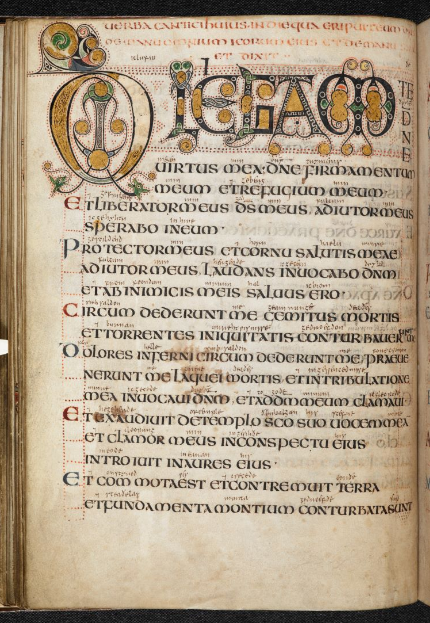 They include manuscripts identifiable as having been made at the abbey; as having been owned there; and as having acquired a tradition, credible or otherwise, that they had been owned by St Augustine or Theodore of Tarsus, the first and seventh archbishops of Canterbury. Richard Emms will consider how the historical context of St Augustine’s Abbey affected its production and ownership of books to circa 1100, with special reference to MSS 44, 267, 270, 286, 291, 320, 352 and 389. 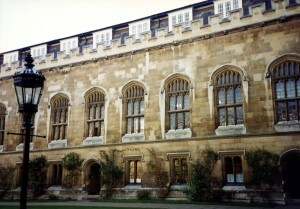 Janet Bately will assess the use made at Christ Church of the oldest surviving copy of the Anglo-Saxon Chronicle: MS 173, Part I.
Nicholas Hadgraft, along with Tony Parker if he is able to attend, will survey suitable, sensitive approaches to rebinding MS 44, whose modern binding has recently come to pieces. 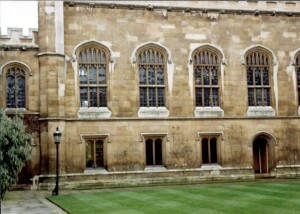 With a break for lunch in College, the Seminar was followed by a Party hosted by the Librarian, Nigel Wilkins, with Tea and Scones in his Fellow’s set in Old Court. 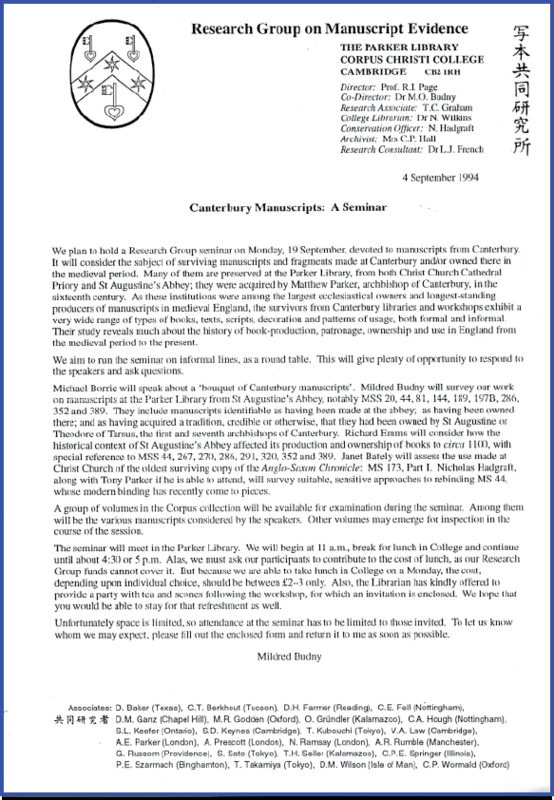 The Report cites the manuscripts which Michael Borrie discussed, via 35mm colour slides, at the British Library. 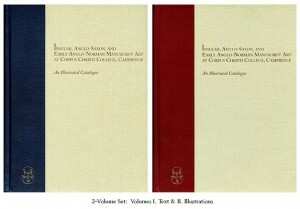 The images shown here, thanks to the subsequent developments in digital imaging, the internet as an entity, and current policy at the British Library regarding the use of images from its collection, represent some of Michael’s choices. We thank him for taking the care to have slides prepared for presentation at the Seminar. [Note: Some of these manuscripts figure in the Illustrated Catalogue (2 volumes, 1997) emanating from the long-term, integrated research work on selected Anglo-Saxon and related manuscripts at The Parker Library of Corpus Christi College, Cambridge. The stages of the research work are recorded, for example, in the Annual Reports to the Leverhulme Trust, described in our Publications. Many of the catalogue entries, as noted within them and the Introduction to the volumes, report the results of discoveries and discussions emerging in our series of Seminars, including this one on Canterbury Manuscripts. © The British Library Board, Royal MS 1 D IV, folios 69v-70r: Opening of the Luke Gospel. Reproduced by permission. © The British Library Board, Arundel MS 155, folio 133r: Saint Benedict and his Monks. Reproduced by permission. 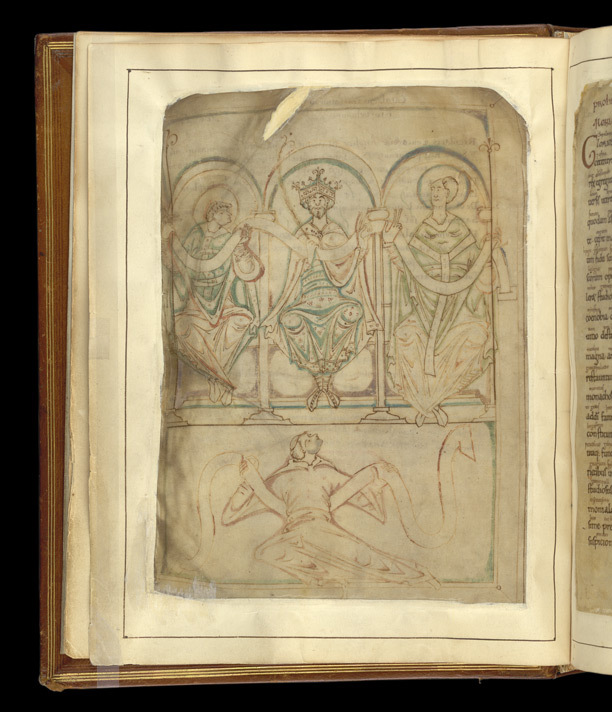 © The British Library Board, Cotton MS Tiberius A III, folio 2v: Authors of the ‘Regularis Concordia’ (Bishop Æthelwold, King Edgar, and Archbishop Dunstan) and their monastic Audience. Reproduced by permission. © The British Library Board, Cotton MS Tiberius A III, folio 117v: Frontispiece to the ‘Rule of Saint Benedict’, with Benedict and his monks. Reproduced by permission. 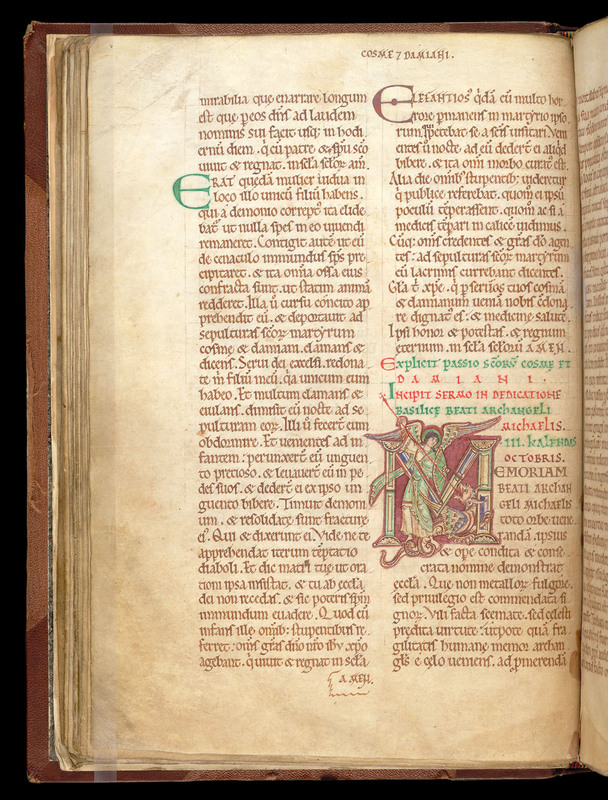 © The British Library Board, Arundel MS 91, folios 26v-27r: Saint Michael and his Dragon open a homily for the dedication of a church to Saint Michael the Archangel. Reproduced by permission. © The British Library Board, Arundel MS 91, folio 26v: Saint Michael and the Dragon in the Martyrology of Saint Augustine’s Abbey. Reproduced by permission. 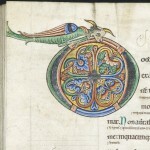 © The British Library Board, Royal MS 10 A.XIII, folio 2v. ‘S[an]c[tu]s Dunstanus’ (identified by beheaded inscription at the top), richly robed as archbishop, bends with quill and knife, and with inkwell at the ready on his draped table, to work on copying a commentary on the ‘Rule of Saint Benedict’, the text of which begins on the facing page. Reproduced by permission. 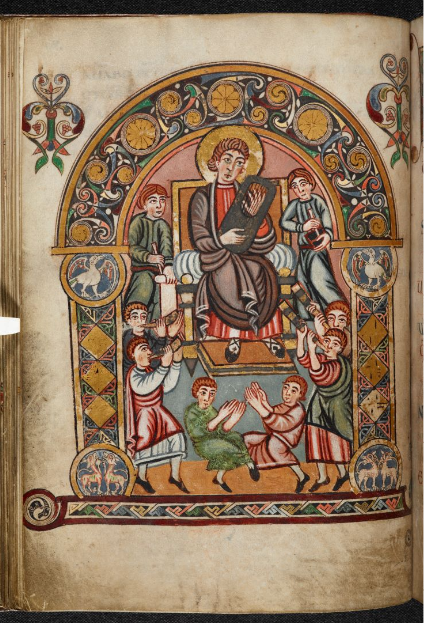 © The British Library Board, Cotton MS Vespasian A I, folio 30v: Frontispiece with King David the Psalmist and his Musicians and Dancers. Reproduced by permission. 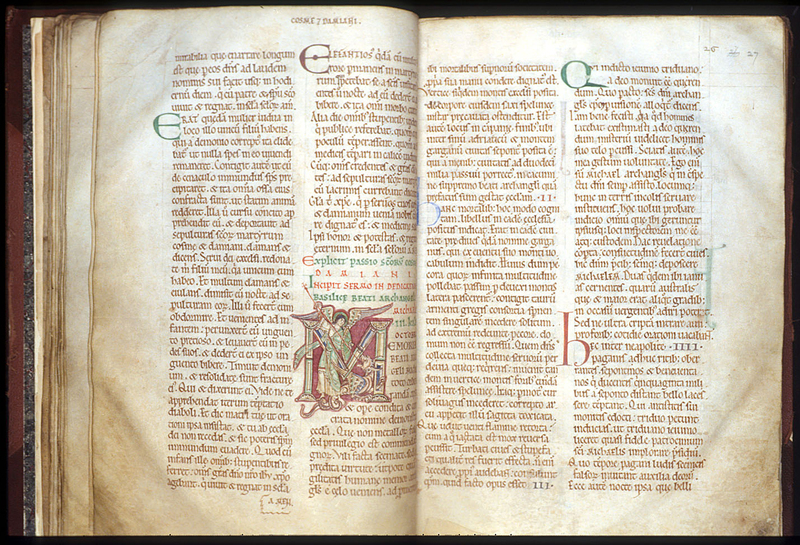 © The British Library Board, Cotton MS Vespasian A I, folio 21v, opening of Psalm 17. Reproduced by permission. © British Library Board. 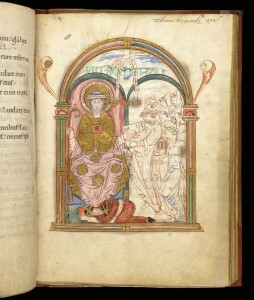 Royal MS 1 E.VI, folio 43r: Opening of the Luke Gospel. Reproduced by permission. 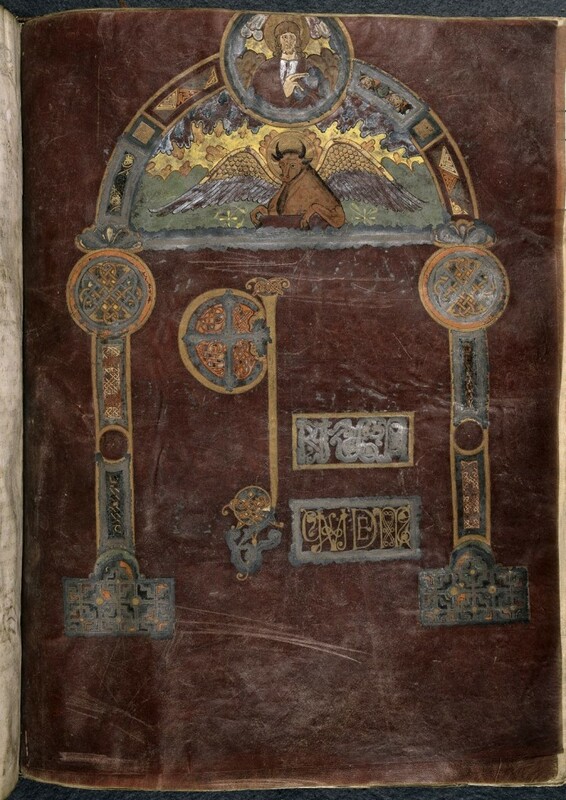 ©The British Library Board, Royal MS 1 E vi, folio 6r: Last of 5 majestic full-page Canon Arcades for the Eusebian Canon Tables. Reproduced by permission. 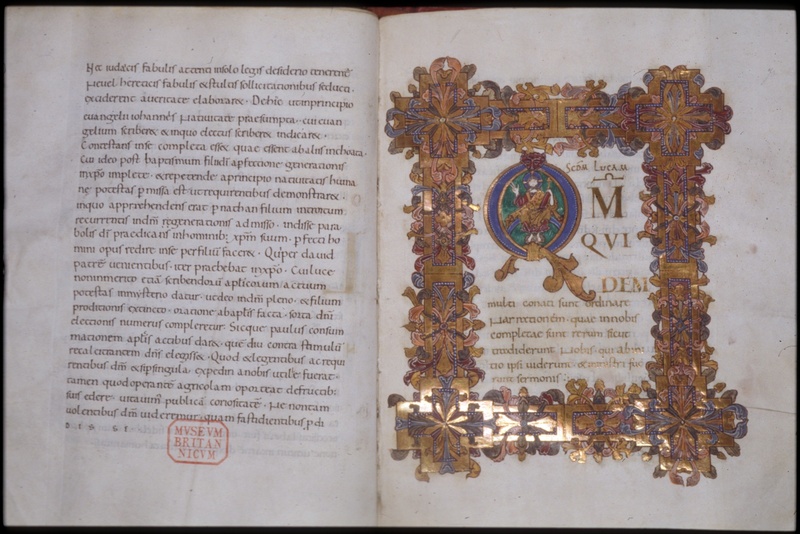 © The British Library Board, Royal MS 1 E vi, folio ii recto, top: Saint Augustine’s Abbey library inscriptions recording ownership, pressmark, and the already-despoiled state of the manuscript. Reproduced by permission. 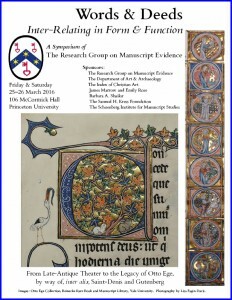 Manuscripts in other collections came into consideration as well in the presentations and discussion, as noted in the summary above of the Report on the day. An unnumbered and untitled 15-page handwritten report by Mildred Budny survives in the Research Group Archives. 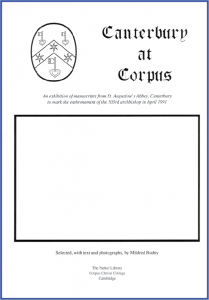 Comprising a form of notes on the day, this text outlines the sequence and contents of the presentations and their discussions, and cites the manuscripts in other libraries (the British Library and the Bodleian Library) mentioned for consideration or comparison. It allows points of confirmation, contrast, or amplification in the event as accomplished for the elements of intention recorded in the Invitation Letter. 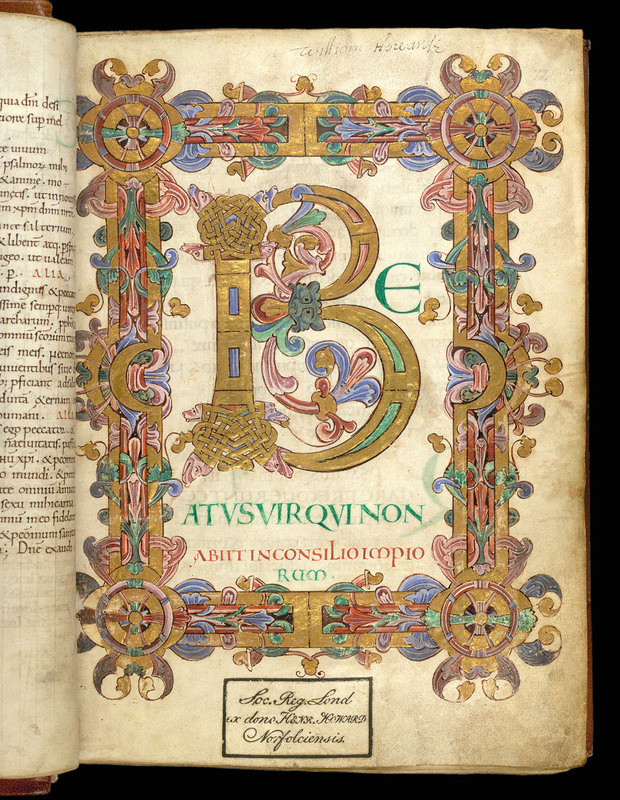 © The British Library Board, Arundel MS 155, folio 12r: Polychrome opening page of Psalm 1, embellished with gold and ornate trellis ornament, interlace included. Reproduced by permission. Old Court at Corpus Christi College, Summer 1994. Photograph © Mildred Budny. The Seminar was followed by a Party, with “Tea and Scones”, hosted by Nigel Wilkins (the Librarian) and Mildred Budny in Room P3 (Old Court). 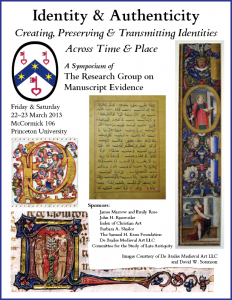 Events organized by the Research Group on Manuscript Evidence once its principal base had located in Princeton, New Jersey, in October 1994 focused on subjects which could be open to the public and did not depend mainly upon direct inspection of some manuscripts themselves. The sequences of these subsequent events are reported within our Seminars, Workshops, Colloquia & Symposia overall. Like the First Series, those events wandered, or rotated, from center to center, as a veritable Moveable Feast. 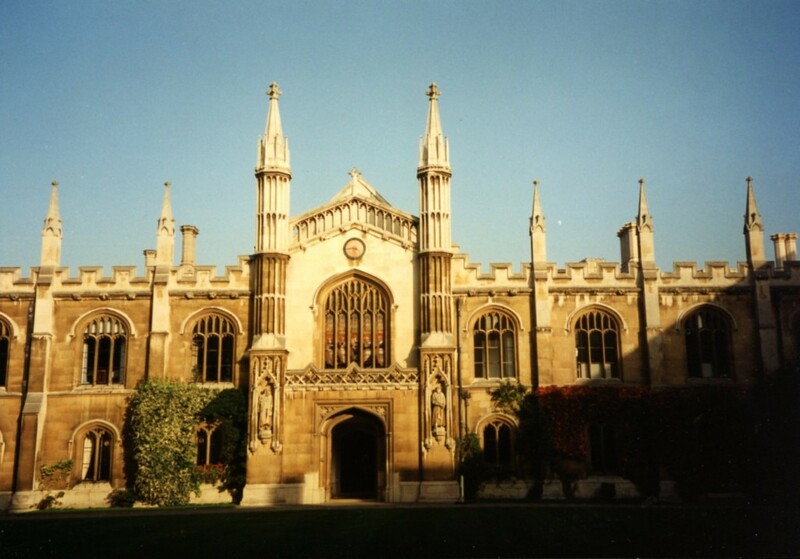 The events brought nourishing Food for Thought, with the contributions of scholars, students, and others, while the hosts and sponsors provided the Food and Drink to keep body and soul together, and the participants offered attention, feedback, and collegiality. Generally, these subsequent events belong to two Series. The first Series centered upon a broad, but focused, topic: the Bible in its complex transmission across time and space, in words, images, rituals, culture, and many aspects of life. The next Series extended into other spheres of exploration, and additional materials, both manuscript and other, without leaving behind altogether the broad subject of the transmission of the Bible. In part this extension emerged through new contacts and collaborations found in, or through, the New World. Thus commenced the series of Events organized by the Research Group on Manuscript Evidence in its new home in the New World. 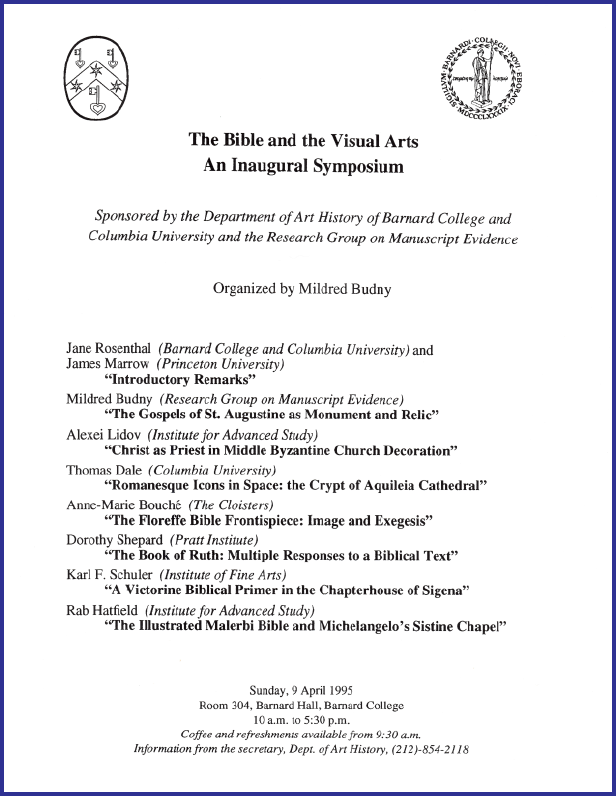 First was the Symposium on “The Bible and the Visual Arts” at Barnard College and Columbia University in New York City in April 1995. 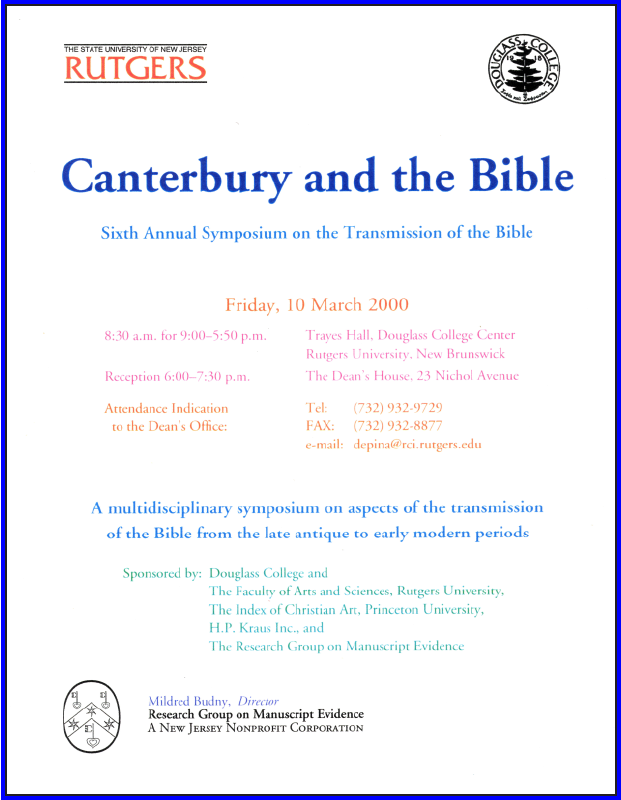 This event launched the Series of Annual Symposia on “The Transmission of the Bible” (1995‒2000), held at different centers in turn. 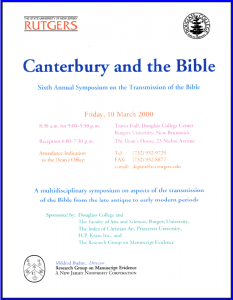 By chance (perhaps), its Series concluded with the Symposium on “Canterbury and the Bible”, held at Douglass College of Rutgers University in New Brunswick, New Jersey, in March 2000. Just as the first Series of Seminars (and Workshops) on “The Evidence of Manuscripts settled onto a title not from the very first meeting, but rather as its meetings soon grew into a vibrant series, so, too, this next Series of Symposia on “The Transmission of the Bible” did not begin with a ready-set Series Title, as it began with a single Event on a specific subject — “The Bible and the Visual Arts”. Soon, responding to its responses and the willingness by different centers to host its Events in turn, it grew into a steady Series with a selected focus. We did not exactly plan it that way; we approached each Event (as we still do) on its own, for its own merits, and in the context of our current and collective interests, contacts, projects, and opportunities. IIb. 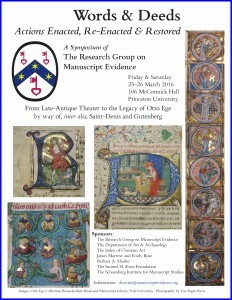 “The New Series” of Symposia, Etc. and more, as reported throughout this upgraded and illustrated version of our website (launched in 2014).